The Secret Life of Pets is the latest CG animated film from Illumination Entertainment. The Chris Renaud and Yarrow Cheney co-directed production follows the pattern of Pixar’s enormously popular Toy Story franchise by giving us a peek behind the curtains of what goes on when we’re not looking at our beloved possessions, only this time it’s not our toys, but our living members of the family so to speak, our pets. The story follows a happy-go-lucky apartment dog Max (voiced by standup comedian Louis C.K.) who lives for the time he gets to spend with his owner Katie (Unbreakable Kimmy Schmidt’s Ellie Kemper), but Max’s world is turned upside down when dog-loving Katie brings home – yikes! – another dog, the stray rescued dog Duke (voiced by Modern Family’s Eric Stonestreet). The much larger Duke and Max immediately get into a rivalry that leads to the two dogs getting lost in the streets of New York City when their distracted millennial dog walker isn’t watching. 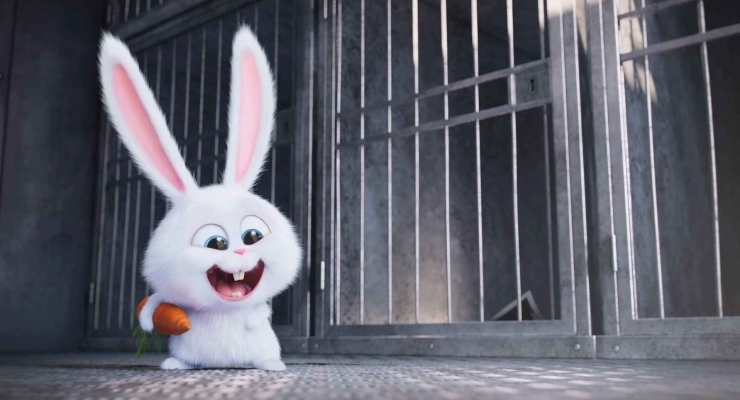 They soon find themselves in the presence of a hostile group of so-called “flushed pets” led by an irascible bunny named Snowball (voiced by comedian and Ride Along star Kevin Hart) who plans to lead the unwanted animals in a vengeful revolt against humans. Meanwhile, back at Max’s apartment building, toy poodle Gidget (Bob’s Burger’s Jenny Slate) who has been nursing a secret crush on Max, realizes he is missing and turns to an intimidating Hawk named Tiberius (voiced by veteran Albert Brooks) and Max’s closest friends, the slow-witted pug Mel (former SNL cast member Bobby Moynihan) and the rotund feline Chloe (BoJack Horseman’s Lake Bell). Pets takes places over the course of one day, so really it’s “a day in the life of pets” and there’s a lot of action packed into that day, or, well, 90-minutes or so if anyone’s counting. Like the Toy Story films things can start to feel like they are getting very crazy. In fact, this is even more outrageous, containing some very violent car chases, threats of death by snake venom and more. The hurried pace of it is perhaps a little overwhelming and even overshadows what is meant to be the core of the film, and that is the growing kinship by necessity of Max and Duke through their travails. Thankfully the comedic actors who voice the characters all do bang-up jobs, especially the understated Albert Brooks who really does come across as scary. Kevin Hart is almost too over-the-top at times to be taken seriously, but the others are all very funny. Lake Bell is so believably disinterested as a the overweight apartment cat Chloe that she practically steals the movie and Jenny Slater’s sweet yet determined Snowball is a pleasure to listen to. Fundamentally, when it comes to these animated CG films these days, the biggest distinction is going to be the story and how they grab you. All of the major studios have caught up to each other technologically now. The Secret Life of Pets has a bit stronger use of 3D pop-out effects than Pixar usually goes for or even DreamWorks, but story wise, it is still a little all over the place in telling a coherent one. The adventure the pets go on is entertaining and the point the try to make about teamwork is a good one, but there are too many hurried subplots to take it all in and too many elements that may be a bit too strong for the younger viewers this is aimed at. 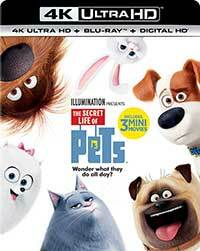 As I noted in my Blu-ray 3D review of The Secret Life of Pets, that version of the home video release was likely the definitive one, I stand by that assessment having finally seen this copy, which was graciously provided to TheaterByte by Dolby. Unlike most 3D CG films from Pixar and even DreamWorks, this Illumination film has a lot of very strong 3D “pop-out” effects. Don’t take that the wrong way. They don’t spend the entire film sticking things in your eye, but when appropriate, things do come way out of the screen, and it works in the wild world that is The Secret Life of Pets. In the flattened, 2D world of the UHD disc, that is truly missed, and the added benefit of the additional resolution and HDR (Hugh Dynamic Range) doesn’t really make up for that. These purely digital productions normally look pristine and full of lots of rich detail and texture anyway, even on standard Blu-ray, and given this is taken from a 2K master source, we aren’t really getting much additional resolution. It’s left up to the HDR to give it that extra “oomph” and while the colors really do sparkle a lot more on the UHD disc than in 3D, especially in the opening scene when Max and Katie are looking at the New York City skyline at night or when Max and Duke are taken into the sewers by Snowball and we see an amazing amount of shadow detail, we only have an incremental step up over the standard Blu-ray otherwise. As stated before, the 3D version is really the most entertaining version and if your display is up to the task, it doesn’t suffer much from dimness or lack of saturation (again, sorry 3D haters). The Secret Life of Pets is given a Dolby Atmos mix on Blu-ray and Blu-ray 3D. It is well-balanced, but use of the height channels is underwhelming. There are some mild atmospheric there, but not much in the way of solid effects; it’s very subtle. The overall balance of the mix is very good, however, and it is surprisingly aggressive given the lack of attention to the additional “Atmos” channels. The low-frequency extension is beefy, so the foley effects sound weighty and much of the action thumps authoritatively. Dialogue is also quite clear and natural in tonality. This set is packed with making of extras, most self-explanatory, that explore the production of the film. Furthermore, we get three mini-movies plus a making of for the mini-movies. Sadly, none of the extras or any of the mini-movies are in 3D except for the sing-along, which is just an excerpt of the scene from the film with Max and Duke going through the sausage factory, with the added sing-along elements. A gorgeously animated wild adventure through the streets of New York with our beloved pets at the center, The Secret Life of Pets has a choppy script made up for with outstanding performances from its stellar cast of voice actors, the forefront 3D animation and the message of friendship and teamwork at its heart.